This article in USA Today looks at Amish growth in Tennessee. As of 2012, the Young Center lists the number of Amish settlements in Tennessee at 6. UPDATE: As of 2014, the Tennessee Amish population has grown to 8 communities and a population of over 2,300. Amish business in Ethridge. Room for more? As the largest in the state, the Ethridge Amish settlement is the focus of the news piece. Nothing is happening at Ethridge that isn’t happening elsewhere: Amish are having big families, land is getting scarce (or it feels that way, at least), some people are thinking of relocating. And some have. The article describes how about 100 Amish from Ethridge have settled near the town of Stantonville, about 80 miles west of the Ethridge community. Stantonville is just a few hundred people in size; nearby Adamsville provides the Amish with grocery stores and other businesses to patronize. The area is adjusting to the Amish. The Adamsville mayor notes that manure on the roads is the biggest problem. Amish will either pick it up, or it will go to fertilize the town’s flower beds. Three of my well known shop customers (non-Amish) were driving horse & buggies got hit from a car, demolished 2 buggies, damaged the 3rd. one. Several people got hurt but none very serious. The think the driver was on drugs. Have a good month. The folks here started moving in about the time we arrived, first ones getting here in 2006/2007 I believe. They come from Seymour MO, which came from Indiana. These are conservative Swiss Amish. Seymour has begun to get too crowded and expensive – become kind of an outlying suburb area for the Branson area. One more reason for them to move here: natural resources! This community seems to come from an area where natural gas drilling is established. That was one of the deciding factors for establishing this community. The land prices were cheap because gas exploration was in it’s early stages. And most land didn’t have a gas lease yet. From what I’ve seen… almost every new Amish family signs a gas lease as soon as possible after they have purchased the property. Are Amish branching out in your state? Any idea where, and why? One effect of Amish growth is greater availability of Amish products such as furniture. Read more about Amish Furniture in Nashville. North Carolina seems pretty stable at this point, with one Amish community. Virginia, I have heard, has a new settlement near Chatham, but I don’t have any details at this point except that it is supposed to be about 5 families. Interesting to know about VA Forest, thanks. I will need to update the state guide at some point though readers’ comments about new communities have added a lot of good updates to many of those posts. There is am Amish com.called Muddy Pond .Monterey. Also Carriage Works.Jerry Wilson 129 Coal Ln. It’s a vary nice place also they have a big saddle and leather shop.And a grocery store. There is a English store there nothing Amish.But keep going and then you will see the Store ans leather shop. Off hwy 61.Big sine that sis Muddy Pond. Also i.m looking for a mud sail this summer in Tn. Thank you and May God our Father bless you. Muddy Pond is not Amish, but Mennonite. We were told by the gentleman who works at the leather shop that they used to be Amish. I’ve been there several times in the last few years, and with each trip, there are new Amish houses both east and west of the highway. Very much a growing community! It’s of interest to me to learn just where the Amish are moving and why…their reasons, what they look for in an area (the natural gas factor was one I’d never heard of ’til now—but it makes sense!). How far do they look into states’ (or towns’) laws/ordinances, etc.? This will be interesting to follow! I just returned from visiting my son, daughter-in-law and new grandson, in the relatively new settlement of Fertile, MN. I think this group is about 5 years old. Ed told me they now have 15 families, and the community is growing fast. Many of these families came from the Pearisburg community in VA. I know that in VA they were frustrated by too much govt regulation and oversight of housing, building, etc. They found land too expensive and the soil poor for growing their crops. They were worried about govt registering livestock too; something that was discussed but I never heard how it came out. I know some of the Amish men from the Pearisburg community spoke to representatives in Richmond about how negatively this would affect their community. In Fertile, Ed purchased land for $1,000/AC. The soil is wonderful (hence, the name “Fertile”) and needs no amendments. There is usually plenty of water (drought this year took its toll), as this is the land of 10,000 lakes. One family in Fertile has extended family in the Ontario community, and so the folks in Fertile feel blessed that winters are not as hard as in Canada (makes me laugh). The difficult thing I keep observing is that these communities that locate near small towns, seem to have trouble finding markets for their produce/goods. The town of Fertile is only 832! The next largest town of Crookston (25 min. away) is bigger but not enough to support significant production of veggies, etc. by the Amish. Unless they find a way to export/ship what they make, how do these groups survive? Fertile – what a wonderful name for a farming community! And what a good point you make about needing a big enough town for a market. The Ethridge Tenn community is just a couple of miles from Lawrenceburg Tenn,a small city, and other small cities aren’t too far. There are a number of small towns within a reasonable radius. And actually, Nashville is within 3 or 4 hours by car, although most of the people I know around Nashville have no idea that there’s an Amish community nearby!Sure hope things go well in Fertile!! Amish markets in remote areas? Anne, loved reading this update about Ed and family. To take a stab at your question, produce can be sold via a variety of venues…the town of Ethridge itself is tiny (about 500 people), but there is a local produce auction which moves a lot of Amish product (there are probably 300+ households at Ethridge, many growing produce). 10,000-person Lawrenceburg TN nearby I’m sure helps, but it looks like Crookston MN is of a comparable size. For other goods Amish manufacturers may contract with non-Amish retailers (furniture and so on) in addition to what they sell locally. Anne, thanks for mentioning your son and his family. Love to see your updates on them. I’m surprised there are no old order Amish in New Jersey with it’s proximity to Lancaster. Perhaps they’re concerned it’s too close to the world (i.e, NYC, Atlantic City, etc.) ? Why no New Jersey Amish? My time in the Garden State has been confined to the interstate, but I believe the state nickname may give a clue that there is a good bit of farmland and green space there. I’ve actually heard that a lot of NJ is quite beautiful. I suspect non-New Jerseyans get a picture of the state via things like Jersey Shore and Atlantic City that may skew peoples’ impressions unfavorably. I don’t think it has anything to do with proximity to cities and the world. Amish do live close to large cities in some states. The price of land, taxes maybe? Anyone with New Jersey local insights? What’s interesting is that I have never seen record of any Amish ever settling in New Jersey throughout their entire history, while NY and of course PA have had quite a bit of settlement. Really appreciate your comments Erik, and you should know, with your research into these incredible entrepreneurs! While we were there, my husband took Ed and several of his Amish friends(by car! )to meet with a wholesaler. This guy told them he could not commit to them for next year; he will deal with whoever gets to him first with the best looking produce at the best price. They want to work with him but it’s hard to invest a great deal in this when you don’t know if you have a market or not! I would like to send Erik some pictures of our little settlement here in Carroll Co, W. TN. I will take a few over the weekend. There are 30+ families in the community. The main industry here is the cabinet shop, harness repair, 2 farriers, construction business of barns, etc. There are a couple of places to shop for groceries, such as German flour, yeast health food supplements, etc. There is a greenhouse and a also little ‘dry goods store’ located in the home,where the cloth and accessories to make Amish clothes, are sold. In the summer months, you will see signs by the road for whatever fruits/vegetables are for sale, right out of the garden. One of my friends sells fresh milk, country eggs and butter. No actual ‘touristy’ places. Some of the nicest folks you will ever meet! I would love to see your photos! What town are these Amish near? 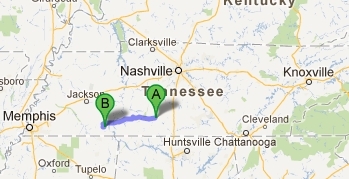 We are in Carroll County, TN… halfway between Nashville & Memphis. The closest small town is Huntingdon, TN. Jackson, TN is about 35 miles away. I will send Erik some photo’s next week. I am from Tennessee and we have a pretty large mennonite area called Muddy Ponds. They make sorghum and most everyone goes there every year to visit and buy some. I live close to Muddy Pond which is just north of Crossville Tn. close to the Big South Fork Park. 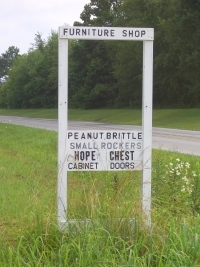 There are several “stores” that sell leather goods, horse tack, custom leather products, a couple of general stores that have all kinds of homemade jellies/jams/sauces/pickles, too many goodies to list. There are several stores that sell wooden porch furniture and custom made furniture . Home decor, oil lamps, even replacement parts, bake goods, candies, fudge, sorghum and produce are just a few of the other things available. If you are in the area it is a great way to spend a day shoppping. btw I have plenty of pictures as well. The article in USA TODAY states, “About 15,000 Swartzentruber Amish live in Ethridge.” Then I noticed that a very reliable website called Amish America states there are 1,500 Amish in Ethridge. A zero may make a difference! Living in Nashville, we like to drive down to Ethridge/Summertown in the spring and fall. It is only about a 2 hour drive. There is a farm, Avalon Acres, that co-ops with the Amish farmers in Summertown and the surround area (not far from Ethridge… that strip of road sort of blends together with nothing but Amish) for a CSA that we order from. They make multiple deliveries in the Nashville area. They have everything from meat, produce, dairy (“pet” milk and cheeses), baked goods, pastas, canned items in winter, eggs, and so much more. It is pretty much your one stop shop that is delivered to us each week from the Amish farms. You can’t beat it. Maria, thanks for sharing this, and neat to hear about the CSA (Community Supported Agriculture for anyone not familiar with the acronym). I’ve never been a CSA customer but have seen them in action. I could use one right now but I think I am a little outside of delivery range 🙂 It’s nice they can operate beyond the primary growing season and into the winter. I know of one in PA that also offers some fall/winter seasonal veggies, though I’m not sure what varieties exactly. I have a question for you, do you happen to have a sense of how many Amish farmers might be involved in this co-op? My name is Jennifer and my husband and I own and operate Avalon Acres farms. We work with 46 Amish family farms in four communities, Ethridge, Summertown, Lobelville and Russell Creek. We’ve developed relationships with them over the years, starting with the Ethridge farmers. We’ve been working with them for just about 10 years now. We’ve seen positive changes to the community as a result of the infusion of cash for their growing for us. On our farm we grow meat chickens, eggs, pork and lamb. After 10 years I’m so happy to say that these communities are almost completely using all organic methods of farming. There was a big learning curve on our part and on their part. Thanks for asking, I love these farmers and enjoy talking about them. I know the new Amish community in Mora, MN is about 15 months old. I believe there are now 10 families there with several other families planning on relocating there soon. They have a community store in their home that is open 1-2 days a week. They also take turns running the Farmers Market in town. There is another gentlemen that has his own produce stand on the other end of town. He said he usually averages $400/day which I thought was really good. He did say that he tried going to a nearby larger town (Cambridge) and he only made $200. He did ask me about the Farmers Markets in St. Cloud and Minneapolis. He did say that an English neighbor would be willing to bring him him but that he would need to make $800 in order to pay the driver as well as make a profit. I know that several other small towns in MN have Amish businesses listed on their websites with the products and services that they offer. Some even include a map to their homes. I did mention this to one of the Amish gentlemen and he said he was not interested. The local paper in Mora has done two articles about them that were nicely done. While they did state that they didn’t want to draw attention to themselves, they did want their new community to know a little about them. They do have a CSA program that had 35 people but they did say that they would love to have it grow to near 1000. They also have flyers available with wooden structures that states that dealers are also welcome. I live about 1 1/4 hours from them otherwise I would love to be a member of the CSA. It does seem that this new community is doing well and growing. Thanks for this detailed info about Minnesota, Erin. Interesting how they have responded to the challenges of making a living in different ways. Do you happen to know where they originated from? The bishop that is there now in Mora, MN came from Hillsboro, WI. I believe that both Fertile and Mora, MN are Hillsboro daughter communities as is Princeton, MO. I have no way of knowing if they have retained full fellowship with Hillsboro. Yes, several of them came from Hillsboro, WI (they’re relatives of Anne’s daughter in law), MO, VA, and Ontario, Canada. Nicest Amish I’ve ever met. There is a large Amish population near Bertha, MN as well. There is an Amish Co-Op in which the Amish bring their products. I thought it was very nice to be all under one roof (it was raining when we visited), but there’s such a peacefulness when among the Amish themselves. Elmer Lambright is the Bishop in Mora, MN. I have not met him but I have visited with his daughters on several occasions. There are a few families in Summertown. However, the community in Ethridge is much larger and much more open to visitors. Ethridge is about 15 minutes east (ese) of Summertown. Was visiting relatives in woodbury tn saw a small amish community there in center hill area.